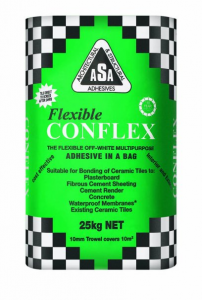 Bostik ASA Conflex is a high strength, fast setting, flexible, rubber modified cement based adhesive used for wall and floor applications. Suitable over concrete, cement render, green screeds, fibrous cement sheeting, plasterboard and Bostik/ASA approved waterproofing membranes. 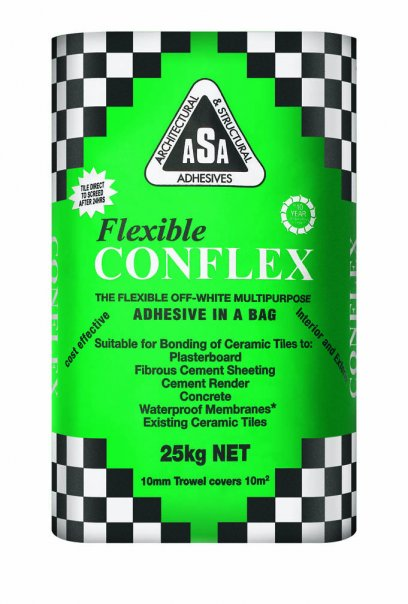 Conflex is recommended for all internal and external application including bathrooms, toilets, laundries, kitchens, decks, verandahs and existing tiles.